This is the second-generation Jaguar XF. The new car promises better economy and lower emissions, as well as more cabin room. We were so taken with the latest XF when we tested it for this year's Tow Car Awards that it won its weight class. Now we’ve had the chance to live with the car for longer and get to know it better. We’re testing the 180PS (178bhp) 2.0-litre diesel automatic in Prestige specification. We already know what tow car ability the XF has – it tows brilliantly. We want to find out more about what it is like to live with every day, how much difference the extra space makes to the car’s practicality and whether familiarity lessens or increases the XF’s appeal. Tow cars don’t come much better. Four-wheel drive could make the Jaguar an even more assured tow car in wet weather or for farm campsites (and there are 4x4 versions of the XF as well as rear-wheel-drive models), but otherwise the Jaguar has just about everything we look for from the driver’s seat. Its kerbweight of 1595kg gives a respectable 85% match figure of 1356kg. 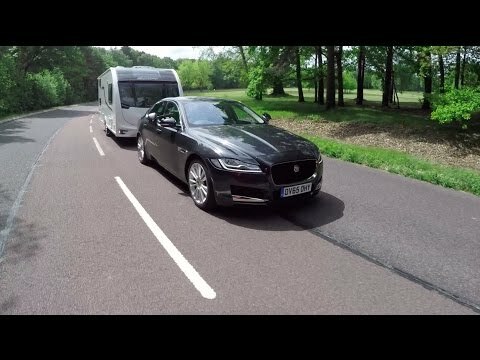 Both major caravanning clubs recommend that experienced tow car drivers can pull up to 100% of a car’s kerbweight, and we’d be happy to pull caravans this heavy behind the Jaguar. It’s worth noting that the second-generation XF’s maximum noseweight has increased to 100kg. For our test, we borrowed a Swift Challenger 590 with a Mass in Running Order of 1410kg. That’s an 88% match. The Jaguar comfortably pulled the Swift, holding speed on steep hills and briskly towing up to 60mph on the motorway. At the test track the Jaguar pulled from 30-60mph in 11.9 seconds. The 178bhp at the top of the rev range helps, but it’s the 317lb ft of torque that matters most when towing. Delivered from just 1750rpm, all that pulling power combines well with the smooth-shifting and responsive eight-speed gearbox so it’s easy to make the most of the available performance. The flexibility of the engine is demonstrated by the brisk 5.6-second 50-60mph time. The torquey engine and automatic gearbox also mean that hill starts are a doddle: the 1-in-10 slope we use in our tests was no challenge at all. We know from the Tow Car Awards that the electronic parking brake will hold car and van still on a 1-in-6 slope. It releases smoothly as the driver applies the throttle, and the engine is strong enough to pull up a 1-in-6 without complaint. Determined acceleration and a can-do approach to hill starts are good, but what really marks out the XF as an exceptional tow car is its stability at speed. If anything, it felt even better in our regular testing than it did during the Tow Car Awards, helped by towing a tourer with a hitch stabiliser this time around. At 60mph it felt relaxed and in control, unfazed by crosswinds or when overtaking high-sided vehicles. At the test track we pushed well beyond 60mph and had no nervous moments. In the lane-change test the caravan was sliding around behind the XF with its tyres squealing, but the Jag never seemed in danger of losing control. Precise steering, generous reserves of grip, and unwavering balance kept the Jaguar on course, with no shoving from the tourer. If you need to stop rather than swerve to avoid an accident, the Jaguar’s brakes perform well, stopping car and caravan from 30mph in 11.1 metres. We’ve tested cars with shorter stopping distances, but we were impressed by the controlled nature of the Jaguar’s emergency stop. If you tow all year round, or favour farm campsites, you may prefer the four-wheel-drive XF. But as a summer-season tow car, the Jaguar is exceptionally good. Sometimes, if you want a car that rides well, you have to put up with soggy handling. Or if you want a taut and responsive car on empty country roads, you have to live with a firm ride. The XF comes closer than most cars to delivering both. While the smaller Jaguar XE has received most of the acclaim in recent months, we think the XF is better to drive. The steering might not be as sharp but it’s less nervous, and the balance between cornering ability and comfort is better resolved, certainly when comparing the XF to an XE with sports suspension. It’s a more grown-up car. Don’t confuse ‘grown-up’ with dull. The XF is a pleasure to drive on a deserted B-road, agile for its size and well tied-down over bumpy tarmac. The JaguarDrive Control allows the driver to choose different modes for the throttle, steering and gearbox, for a sharper or more relaxed drive. At motorway speeds the Jag is composed and comfortable. Road, wind and engine noise are all kept to reasonable levels, making the XF a fine car for long journeys as well as cross-country blasts. You can hear the engine if you work it hard but not excessively so. There’s no doubt it’s a four-cylinder engine rather than a silky-smooth six, but at a steady cruise it’s very quiet. There’s a slight vibration through the driver’s seat when the engine idles, and the stop-start system can feel a little abrupt when it restarts the engine. But all told, the Jaguar XF is a very fine car to drive. Here’s where the XF has most noticeably improved: there’s now more room in the cabin, especially in the back seats. Headroom isn’t especially generous but there’s much more legroom than before, enough for a passenger of over six-feet tall to stretch out behind a tall driver. Air vents between the front seats keep those in the back supplied with chilled air, while the fold-down armrest has two cupholders should they get thirsty. The rear seats are better suited to two rather than three: the prominent transmission tunnel will have three back-seat travellers fighting over foot space. Up front, Jaguar has retained the theatrical touches of the old XF. The outer air vents still rotate open and shut when the engine is switched on and off, and the circular gear selector still rises from the transmission tunnel. The driving position has plenty of adjustment, and the seats are comfy and supportive. In truth, though, while the standard of fit and finish is good, the new Mercedes-Benz E-Class feels more special inside. For an executive saloon, boot space is good. It’s not a tall luggage area, but it’s long, yielding 540 litres of space (that drops to 505 litres with a compact spare in place of a tyre repair kit). It’s possible to fold the seats down for more space, although there’s a drop between the boot floor and the back of the seat and a noticeable slope. In Prestige spec, with the 180PS engine and automatic gearbox, the XF costs £34,550. Haggle and, according to What Car?, that should drop to £31,916. That’s a reasonable price for a car with this much performance and space. It comes with lots of safety kit, too, with Traffic Sign Recognition, Trailer Stability Assist, Lane Departure Warning and Autonomous Emergency Braking among the high-tech systems included in the price. The XF has been awarded a five-star safety rating from Euro NCAP, suggesting all that technology does its job well. An eight-inch touchscreen, satellite navigation, voice-activated controls, Wi-Fi, a DAB radio and leather upholstery are also standard. Don’t forget, Prestige is the most basic model, so there’s plenty more kit if you look further up the range. The official combined fuel economy figure is 65.7mpg. Carbon dioxide emissions are 114g/km, which should help keep company car drivers’ tax bills affordable. Of course, it’s hard to match the official figures in real-world driving, but we achieved 28.5mpg towing with the Jaguar on a mixed route of single- and dual-carriageway A-roads and some minor roads. When the time comes to sell on the Jaguar, What Car? predicts it will be worth 52% of the original list price. That’s not a bad return on your money. For its reasonable purchase price, standard kit and resale value, the XF makes a sound buy. The Jaguar XF is an outstanding car, not just for caravanners but for anyone shopping for an executive saloon. Rear-wheel-drive four-doors may not be the most obvious tow cars, but the best of them are very good at pulling a caravan and the XF is certainly one of the best. Stability is what we value above all else when we test a tow car, and the XF is just about as stable as they get. It’s absolutely unfazed by having 1400 kilos of caravan behind it, towing straight and true with next to no help from the driver. Even in breezy weather, point the XF in the right direction and that’s where it goes. Our emergency manoeuvres – especially the lane-change test – often show up shortcomings that aren’t apparent in everyday towing. Not with the XF. It easily handled violent changes of direction with a caravan in tow. It’s a fine car to live with every day, too. On the right road it can entertain, but if the right road is packed with traffic it can be soothing and relaxing, too. More so than before, passengers can enjoy the ride as much as the driver. Rear-seat space is much improved, with enough room for tall adults to travel in comfort. They won’t have to travel light, either, thanks to the surprisingly roomy boot. For an upmarket car, the XF is good value, certainly in Prestige spec. It’s well priced, well equipped, cheap to fuel and holds its value well. Having spent time with the Jag, we’re more convinced than ever that it was a worthy category winner at the 2016 Tow Car Awards.